Looking for a cat feeding mat? 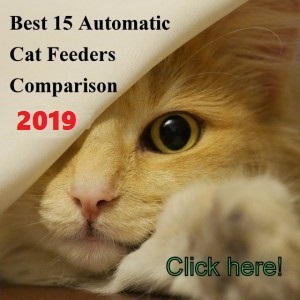 here you will find good information of the most popular feeding mats with Pros and Cons. 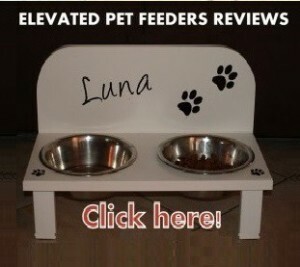 Choose the most suitable for your pet, considering always at least 4 inches of free space from the food bowls. Some of the feeding mats can be used to place the water fountain as well. Petfusion food mat is made with non-toxic and non-allergenic soft silicone material with a nice design that fits with any modern decor. This durable mat is very easy to clean with running water or you can simply wipe it with a wet cloth. 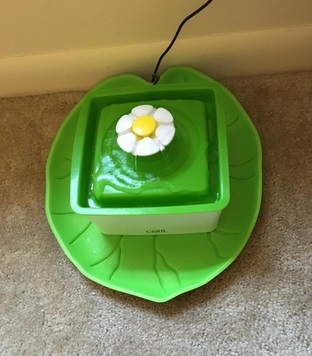 The mat is flexible to bend for cleaning and it has anti-slide bumps on top and bottom that keep the bowl from moving and allows the mat to stay in place. High quality and durable material made to last. 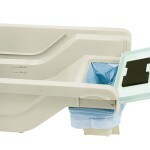 It’s very easy to clean directly into the sink or wipe away dirt with a cloth. It has a raised lips on edges to contain water or food spills, excellent for messy pets. Excellent non-sliding system for bowls and floor. Petfusion pet food mat works excellent in protecting floors and carpets from spilled water and food. 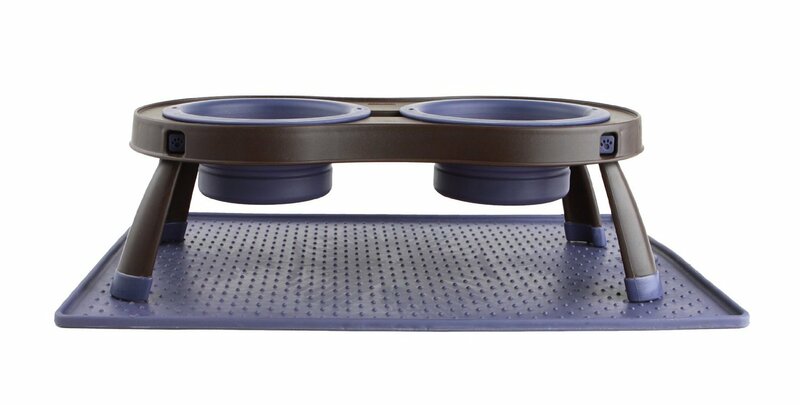 Its raised lips on edges does a good job containing all the spills and non-sliding system on both sides allows the mat to effectively stay in place and keep the bowls from moving around when your pet is eating or drinking. 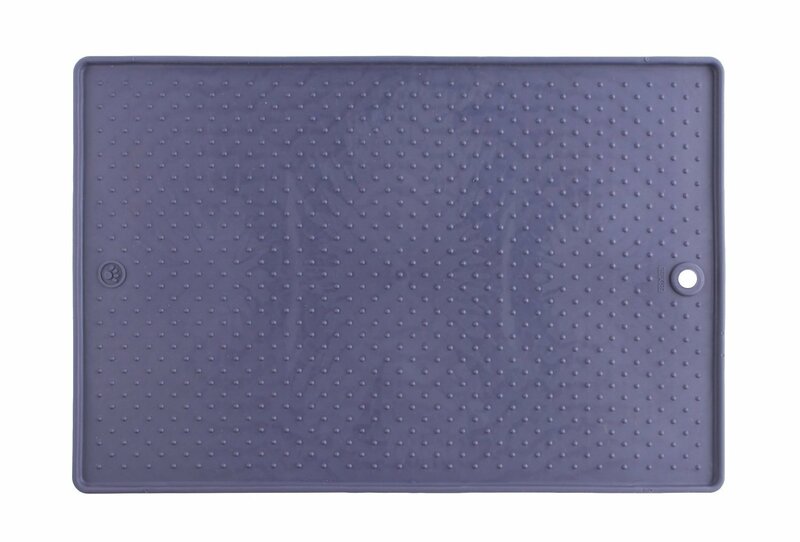 √ I highly recommend this cat food mat for all cats and small dogs. Especially for messy pets. 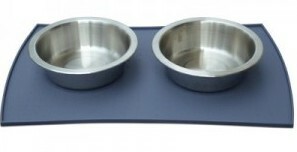 The JW Pet Company Stay in Place Mat helps to protect the floor from spills or food when your cat is eating. This mat has slightly raised nubs on the surface to help the cat bowl or dish to stay in place. 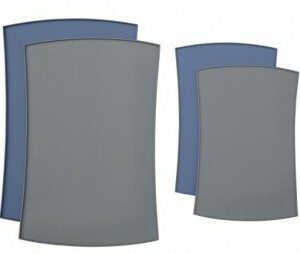 Stay in Place Mat’s rubber edges in each corner help to keep the mat from moving around. Rubber edges help the mat to stay in place. It helps to keep your pet’s feeding station clean. Suitable for dogs and cats bowls. Rubber corner edges help to keep the mat stable on the floor. Raised edges help to prevent water spills or food from getting on the floor (Very good at containing water spills, even in big amounts). Slightly raised bumps help to keep the food or water bowl to stay in place. As the raised bumps on the surface are not rubberized, a metal dish or bowl won’t stay firmly in place. You cannot choose the color of the mat. Even though the rubber corners edges help to keep the mat stable on the floor, it could still be moved by an active cat or dog in a tile or wooden floor. To be used in carpet. 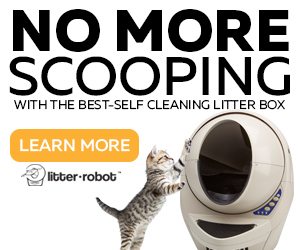 With non-metallic dishes or bowls if your cat moves them around when eating. If your cat eats normally, it’s fine using it with metal bowls. If you don’t mind to receive any color. 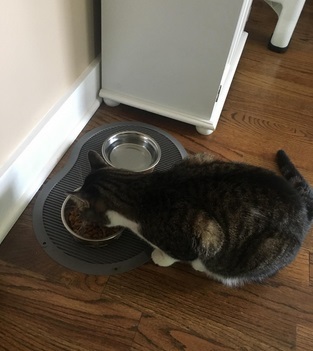 Dexas Popware is a non-slippery cat food bowl placemat that protects floor from getting spills or food when your cat is eating; it has a special design with raised edges to protect the floor from spills or food. Special nubs in the feeding mat keep the bowl from moving around. 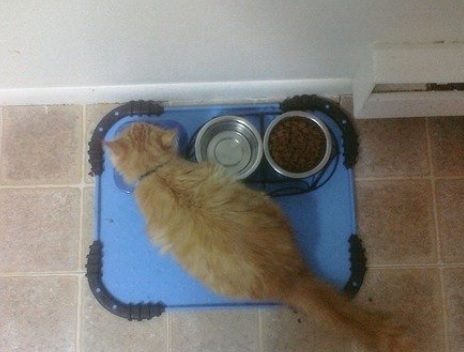 The cat feeding mat is made with special rubber that gives the non-slippery characteristic to this mat. It is suitable for any type of floor, tiled, carpeted or hardwood. It is easy to clean. For any type of floor, hardwood, tiled or carpeted. Very durable, thick and robust mat. With raised edges to protect the floor from spills or food. With little nubs that allow it to stay in place, it does not move around and the bowl does not move either. Good size for three small or two large bowls. There is a hole in one side of the mat that might let spills get through. This cat feeding mat works just as advertised. 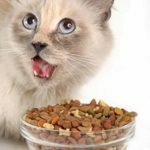 It does help in keeping the cat bowls or dishes from sliding across the floor and it also protects the floor from spills or food. 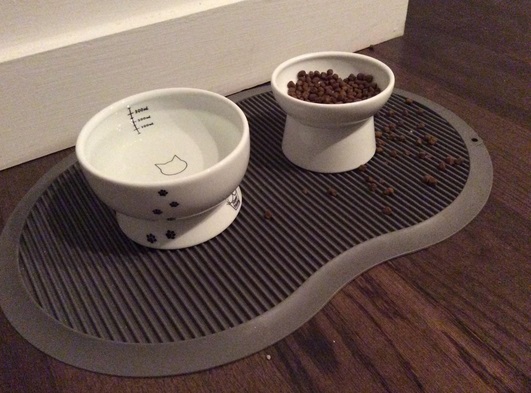 This cat food mat has a nice size; you can place a regular sized fountain and two little food bowls with no problem. If you have a messy cat when it comes to eat or drink water this feeding mat (or any other mat) would not work. If your cat moves the bowl around when is eating. If you want a cat feeding mat with no hole on the end. 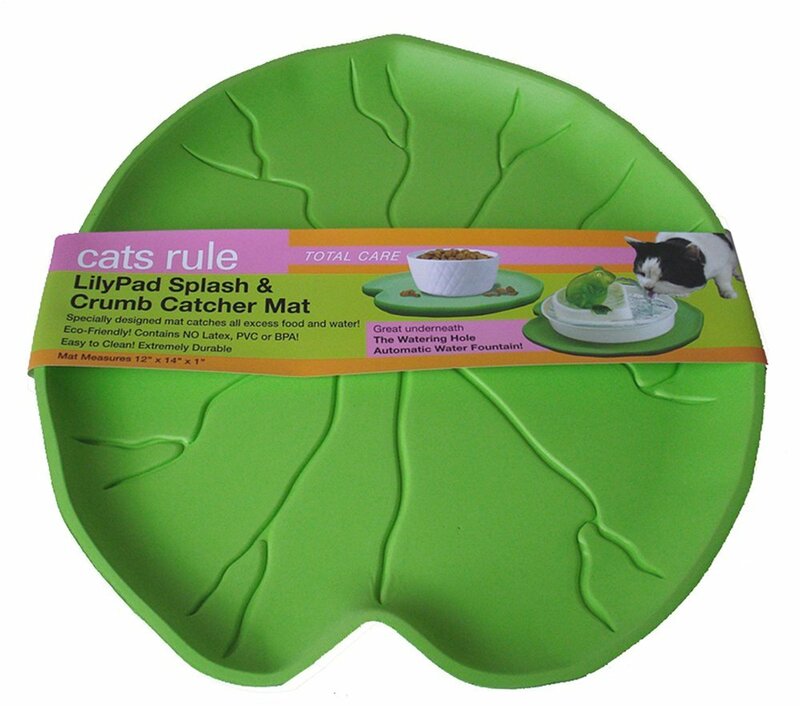 Cats Rule Lilypad Splash and Crumb Catcher mat is a very unique Lilypad shaped pet mat that helps to contain water spills and food when your pet is drinking or eating. The Lilypad mat features a special lip to keep spills or food from getting on the floor and is easy to clean. The mat comes in two colors: lime green and taupe and it is made of durable foam material EVA (Ethylene Vinyl Acetate) with no latex, PVC or PBA. Nice and unique Lilypad shaped design. It is made with foam EVA material, PBA free. Foam material holds the water instead of soaking in. The Lilypad mat’s “veins” underneath allow air go through, stopping mold from growing. The foam is flexible and very easy to clean. The mat gets scratches if your cat likes to use its claws on it. 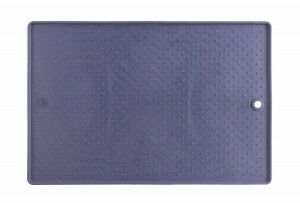 The mat is thin and not made with rubbery material (not non-slip). If you don’t clean the mat often, the mat can get water-filled to the point of being hard to carry it to the sink. This is a good pet water and food mat that works as advertised of catching spills and crumbs from getting to the floor. 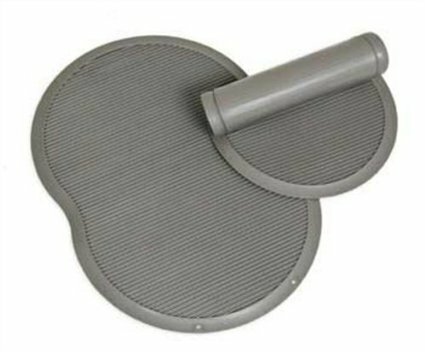 This mat is not non-slip and its main function is to keep the floor clean from the pet feeding and water station’s activities. As the material of this mat is thin foam, it is not suitable for a chewer cat or a feline that loves to claw at everything. Cats that don’t chew or claw to things. The Petmate Le Bistro feeding mat helps to protect floors catching all spills and crumbs with its raised border. The interior ribs contain spilled water from going on the floor. 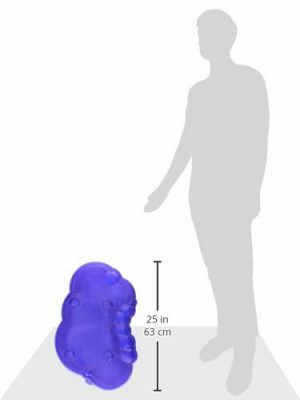 The mat is flexible and made with non-slip rubberized material to ensure it will stay in place. The Petmate Le Bistro food mat is very good for tiled or wooden floors. The mat is easy to clean and it comes in small and large size. Raised ridge helps to keep crumbles and spills from falling to the floor. Made with flexible and non-skid rubberized material. Very good on tiled or wooden floors. The edges are raised but they could be a little higher. Food’s crumbs get caught within the ribs so you have to shake it to clean it. Even though the mat stays in place, if used by sloppy pets it could still move a little. It has a tiny hole on one of the extremes. This is a good cat food mat that works as described. 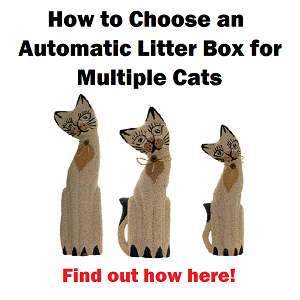 Due to its shape it might be a little smaller in the middle, but if you have a kitten or an average adult cat the small size will work just fine. The material of this mat is of a very good quality, considering the price of this item. With a heavy feeder or fountain this mat works even better. 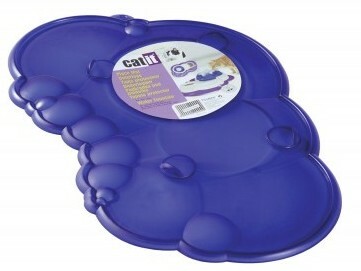 The Catit Placemat is a placemat made from PVC that has been designed to be used with the Catit water fountain. 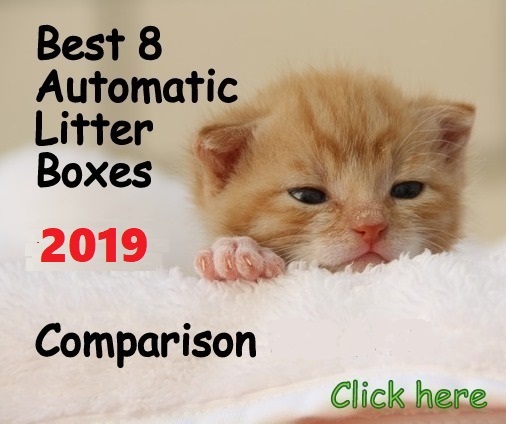 It helps protect floors from water spillage when the cat is drinking and also it is perfect for playful cats that use the fountain as entertainment, splashing water everywhere. 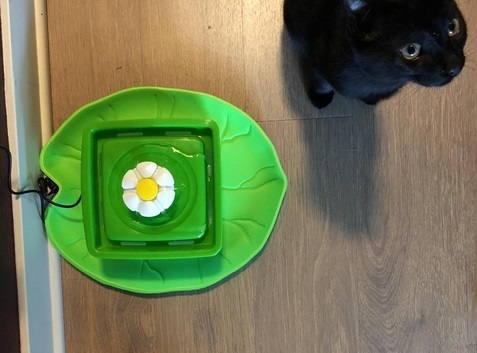 The mat is designed to place the Catit fountain and a food bowl. Good complement for the Catit Drinking Fountain. 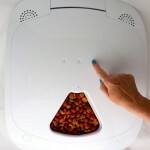 It minimizes the noise of food spilling. It is big enough to make it hard for cats to move the mat around. 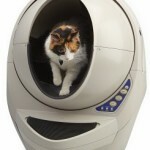 Designed only to fit the Catit water fountain with a food bowl. This is an excellent mat that is made as a complement of the Catit fountain. The mat has been designed with 4 nubs to hold the Catit Fountain in place and are snug against the fountain so it does not move. 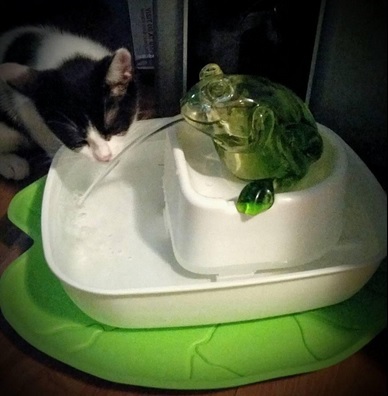 It is big enough to place the Catit Fountain and a food bowl. 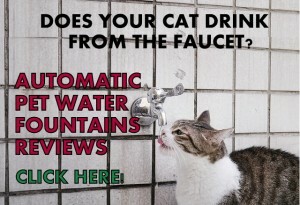 This is for cats that like to mess with the fountain, pushing it around and spilling water all over the floor when doing it. This mat will cut down on the mess. 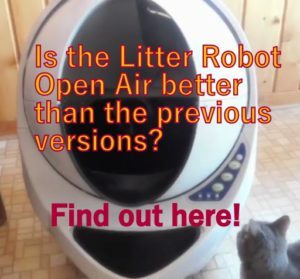 √ I recommend it to all who have the Catit Water Fountain. x I don’t recommend using it with another water fountain or if you want to use it only to place food bowls.